Richard Anamoo, Director-General of the Ghana Ports and Habours Authority (GPHA), says his outfit would soon begin the construction of a terminal to boost the exportation of agricultural produce to other countries. According to the GPHA boss, work on the terminal, which is estimated at $10 million, would commence in January 2016 and completed in eight months’ time. 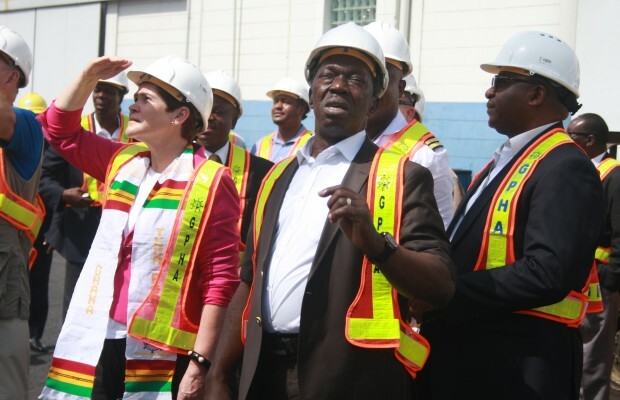 Mr. Anamoo made this known when Deputy Secretary for the US Department of Agriculture (USDA), Krysta Harden led a 26-member trade delegation to the GPHA headquarters in Tema on Monday. “A lot of groundwork has been done by the private sector. We have given them the agreements and everything. Some of these agricultural produce to be exported include pineapples, mangoes and bananas, among others,” he said. Mr. Anamoo, after taking the US delegation on a tour of the Tema Port, added that the contract had been awarded to Super Meridian. The project would generate over 1,000 jobs during the construction period. The US team also visited a cocoa site at Nsawam in the Eastern Region where they were educated on the processes cocoa beans go through before they are exported to international market. Noah K. Amenyah, Public Affairs Manager at Ghana Cocoa Board (COCOBOD), said his outfit was collaborating with farmers to work on cocoa sustainability programmes that were replicated in various parts of the country. He said COCOBOD was optimistic the cocoa season would be better this year. “The season has just begun and there are indications that we are doing well. As of now, production has exceeded what pertained around this time last year. We have projected to get 850,000 metric tonnes cocoa nationwide. Last year, we did 782,000 metric tonnes,” he said. When the delegation visited Blue Skies Ghana Limited at Nsawam, Anthony Pile, Chief Executive of the company, commended the team and expressed hope that the visit would foster a strong relationship between his outfit and the US companies.